This Executive Chalet is an amazing value for a great price! Chalet 103 is located near the front of the resort and is only a short walk to the Clubhouse and Resort Amenities or to the Free Bus Stop. As one of our only 2 bedroom, 2 bathroom cabins this executive is equally spacious and cozy! The decor throughout the cabin screams of mountain elegance. The main Bedroom has a queen bed with plenty of walking space and large windows that provide tons of natural light! The 2nd bedroom is set up with a bunk bed (Full on the bottom, Twin on the top) which is a decorated in a clean yet not too grown up manner, perfect for guests of all ages! The Cozy Living Area in the Colorado Room has a sleeper sofa that provides for extra living space during your stay. This space has comfortable seating for 6 people and a Large Television which is perfect for enjoying movie night after hitting the slopes. Large parties need not worry because this Cabin has 2 full bathrooms, both with walk-in showers. Save a little money for souvenirs by making your meals at home in a beautiful Fully Furnished Kitchen. The open concept style allows the cook to enjoy the family while also having plenty of counter space to prep a large meal or make cookies with the kids. The large dining table has 6 chairs and yet 8 can eat in the same area with the use of the coffee bar located in the kitchen. 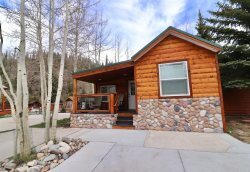 This is the perfect cabin to enjoy the mountains with your family and friends!!! Our resort is simply gorgeous! We know you appreciate a well-kept park, and ours is the nicest you'll ever find. We go out of our way to offer a clean and attractive environment, with the comfort and convenience of home, all in a very natural setting. As you stroll around the grounds, you'll love the little things that make our resort an exceptional place to vacation. Experience real Rocky Mountain Magic! Our resort is in the heart of Colorado's best outdoor activity area, and we offer four seasons of fun for everyone. Hike or bike your way through incredible natural forests over 60 miles of paved pathways, from Breckenridge all the way to Vail! Skiing of all types is available at your choice of four nearby ski areas, and the two rivers adjacent to the resort bring the wilds of nature right to your cabin door!